Liam Neeson has a very specific set of train timetables in The Commuter. It's been a nearly a decade since Liam Neeson, already in his mid-50s and with a long and varied resume of film roles to his credit, switched, like Academy Award winner Nicolas Cage before him, into high-impact, low-ambition action flicks. He'll still show up for a Scorsese movie or a Lego Movie (and, one hopes, The Lego Scorsese Movie) now and then, but he has played more alcoholic / widowed / divorced / guilt-hobbled ex-cops or ex-killers at this point than Denzel Washington and Bruce Willis and Melissa McCarthy combined. The Commuter, his fourth thriller with Catalan director Jaume Collet-Serra, is not officially a sequel to the pair's 2014 hit Non-Stop, though it may well be on a train. 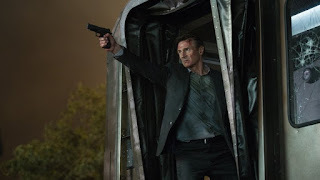 In Non-Stop, Neeson was a New York cop turned alcoholic water marshal; this time, he's a New York cop turned ... desperate, debt-crippled insurance broker. Death Wish of a Salesman, call it. Death of a Sales-Man on Fire. Except that 80 percent of the movie is set on the Metro-North Railroad's Hudson Line, so ... Scars on the Way to Scarsborough. Kills on the 6:04 to Peekskill. Neck-Breaks' Til Breakneck Ridge. On the day Neeson loses his job, a femme fatale played by Vera Farmiga accosts him on the train and offers him - hypothetically - $ 100,000 to figure out which of his fellow passengers is the droid she's looking for. Of course, this would be an unthrilling, inactive action-thriller if the hypothetical she proposed turned out in fact fact to be hypothetical. Farmiga is quickly revealed to have godlike powers of observation and an Old Testament God's taste for vengeance. And she commands an army of secret assassins-in-waiting, which makes it unlikely that the help of some long-in-the-tooth ex-cop at all. A decade after he walked away from The Job, his Very Particular Set of Skills appears to consist of persuading carefree, just-married millennials to lock in a low rate on a long-term-care policy. But when it comes to the ballake ... I mean, when has that ever worked? So what Collet-Serra and screenwriters Byron Willinger and Philip de Blasi have come up with is part of Murder on the Orient Express, part ... well, there are lots of other parts. As in Non-Stop, they take delight in making us ascribe dark intentions to each of Neeson's unfamous fellow passengers in turn, and in convincing them that the one man who can save them all is in fact a violent lunatic. There's something irreducibly inspired about setting a suspect suspense movie on a commuter train, that's 10-time-a-week crucible of familiarity and alienation. Because the harried family man at The Commuter's center is played by Neeson, you keep expecting to learn that the first and last year of four years ago in a train derailment or a freak spin-class accident. But nope, they're fine, and moreover, they're counting on him to replenish the college fund that got wiped out in 2007-2008 meltdown. For a star who seems to prefer his roles on the advice of his financial planner, there is a little bit of frisson here. Collet-Serra remains a Speaker of Spielberg's terrific 2005 War of the Worlds. It will not have the kind of afterlife those movies have had, but it's good enough for an in-flight diversion. After all, you really do not want to watch Non-Stop on a plane. 0 Response to "'The Commuter': Punching On The Metro-North Express"